Sometimes experiences in life are sweet like honey, and sometimes they are salty. At Rosh Hashana, we eat honey and other sweet dishes as "good luck" for a sweet new year. Apples in honey, honey cake, honey cookies and tzimmes with a drizzle of the sweet stuff are common. 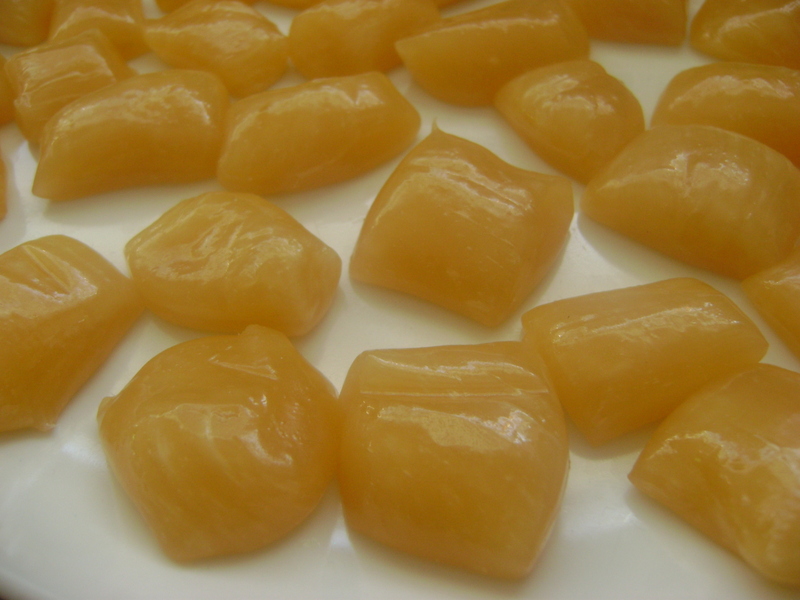 I came across a recipe for honey candy which mimics a European honey (miele) candy I tasted years ago-- hard on the outside, a gooey burst of honey inside. Pure flavor, not artificial. I thought it would be a neat project with the kids before rosh hashanah. They MUST be kept away from the boilng honey/sugar-- that is non-negotiable. I wouldn't want this sweet situation to turn into a salty one! But, they can stretch and roll the cooled candy, and little hands are good for wrapping the candy to give to friends and family for a sweet and happy new year. May you all enjoy a shana tovah u'metukah, a sweet and happy new year! 1. Generously butter a 9x13-inch metal baking pan. 2. Pour the sugar and honey into a heavy-bottomed saucepan. Over high heat, bring to a boil. No need to stir. Let the mixture boil until it registers 300 degrees F on a candy thermometer, at which time it will appear to be nothing but a mass of frothy golden bubbles. Immediately pour the hot mixture into the greased pan. 3. Let it cool just enough that you can handle--about 10 minutes. It should be quite warm and malleable. Butter your hands well, and keep a little butter ready to re-grease as necessary. Scoop the mass of warm honey into your hands and begin to stretch and fold it. Stretch and fold the candy and and watch as it turns pale and begin to glisten. It should be a light golden color. Keep stretching and pulling until the candy is cool and starts to stiffen. 4. You must work quickly on this step. Working on a non-stick cutting board, silipat or clean counter, roll the honey mixture into skinny rope, 4 to 5 feet long (or divide into 5 pieces and create 1 foot long ropes). With a scissors or a sharp knife, snip rope into 3/4-inch long pieces. Let cool completely. 5. Store in a cookie tin or plastic storage container--make sure unwrapped pieces don't touch each other (unless you want a really BIG piece of candy). Or wrap in small squares of waked paper. The candy gets sticky after a few days.